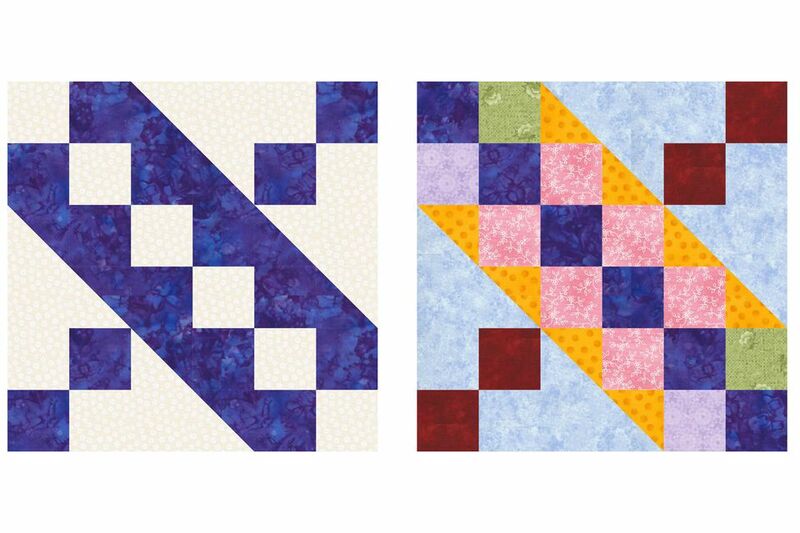 You can create a wonderful quilt using this Jacob's ladder quilt block pattern. It is a popular and traditional design and the individual blocks can be sewn together to make any size quilt you like. You will need two colors of fabric, rotary cutting equipment, sewing machine, and thread to make the blocks. You will need an iron to press the seam allowance. Traditionally, the Jacob's ladder pattern uses just two colors of fabric, one light, and one dark. It is a fun one, however, to make as a scrap quilt by using as many fabrics as you desire and is a great pattern if you're looking to get rid of a lot of your scrap fabric. The beauty of the Jacob's Ladder is that the quilt blocks create a linking design when they're sewn side by side. If you like, twist and turn the blocks to make the diagonal links flow in different directions. Between the block placement and the fabric, this is a simple pattern that allows you to be very creative in a variety of ways. It's easy to assemble the quilt blocks from a combination of quickly pieced four-patch and half-square triangle units. Each Jacob's ladder block finishes at 12 by 12 inches square. The pattern instructions are for the two-color block but you can use any combination of colors or patterns that you please. Sew the 2 1/2- by 26-inch light and dark strips together lengthwise. Press to set the seam. Press the seam allowance towards the darker strip. The strip set you just made should measure 4 1/2 by 26 inches along its entire length. Square up one end of the strip set with your rotary cutting equipment. Starting at the squared-up edge, cut (10) 2 1/2-inch wide segments from the strip. Square-up the leading edge again if necessary to cut accurate segments. You will have one extra inch to play with as you cut the segments, so trim off only what's necessary. Sew two segments together as shown in the drawing to make a four-patch unit. Lights and darks should be positioned diagonally from each other. Press the seam allowance in either direction or fan out the seams to reduce bulk. The four-patch unit should measure 4 1/2 inches square. Make four more four-patch units from the strip-pieced segments. Set aside. Pair a light 4 7/8-inch square with a dark square of the same size. Use the easy half-square triangles method to sew the squares together before cutting the pair apart diagonally. When complete, each of your two half-square triangle units should measure 4 1/2 by 4 1/2 inches. Repeat these two steps to make two more half-square triangle units from the remaining 4 7/8-inch squares. Arrange the units into three rows as shown. Pay close attention to the position of lights and darks in all units. Sew the components of each row together. Press the seams towards the four-patch units. Sew the rows together, butting seams carefully so that the units match up at the intersections. Use straight pins to secure the fabrics. Compare your quilt block to the drawing to make sure it is sewn correctly. Your block should measure 12 1/2 by 12 1/2 inches. The extra 1/2 inch on each side is used as a 1/4-inch seam allowance for constructing the full quilt.